You’ve just dyed your hair the most gorgeous shade of ruby red, you couldn’t be happier, and then it starts—the constant color fade. What once was a gorgeous ruby just a few weeks ago is now a faded, brassy disappointment. Such is the life of a bottle redhead. But fear not, there are ways to reduce red’s tendency to fade. One of the best methods for keeping red color is to wash your hair less. That’s the sad truth about holding onto all wild, vibrant colors. Every time you wash, it will fade the color, even if just slightly. If you have the kind of hair where you can get away without washing for two or three days, take a break from the shampoo. Also, watch the temperature of your showers. If you wash your hair in hot to warm water, it opens the hair cuticle and allows those color molecules to drop out of the hair. In short, less washing and less hot water means more color. Like it or not, having dyed red hair gets to be a bit of a lifestyle. There are things you just can’t do, unless you plan on re-dying your hair afterwards. Chlorine is a no-no, so wear a swim cap. The sun will also bleach out your hair color, so wear a hat or keep out of the sun. Keep your hair away from heat-based styling products like blow dryers, as well. Those also tend to open the hair cuticle layer, which leads to color fading. Personally, I’ve never been able to give up the daily hot shower, so that’s when you have to call in the heavy-duty products. Since washing your hair will fade it, one of the best defenses for red hair is to invest in a color depositing shampoo and conditioner. Some color depositing systems can be pricey, so if you’re going to skimp, the best option is to get the conditioner and let it sit in your hair for a few minutes after washing. That will give your hair a bit of a deep condition while depositing more color. Some of the most popular brands for red color depositing shampoos and conditioners include Aveda Madder Root and Quantum Riveting Reds. You can also try a red glaze product, like Ulta Red Color Enhance Glaze. For the most vibrant of red shades, try throwing some conditioning temp dye like Manic Panic’s red shades into your conditioner. You can add a little for a slight highlighting effect or a ton for dramatic color. I usually use about one part dye to three parts conditioner, and that gives a rejuvenating dose of red. Since fadeout is just a natural fact of the bottle redhead’s life, another option might be to learn to love it. You’ll need to experiment with hair dyes, and see how they fade out on your hair over time. Everyone’s hair is different and reacts to certain products differently. Some hair holds red shades forever, some fades instantly. 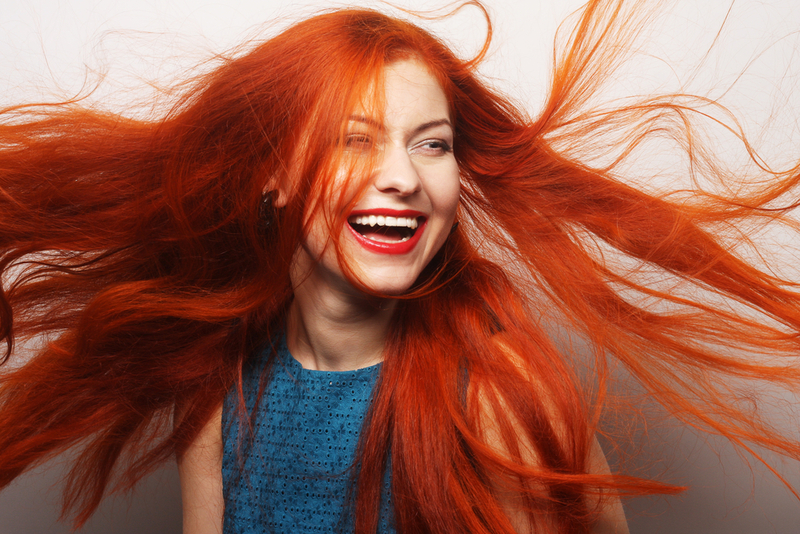 Many red dye products will gradually fade into a more natural coppery hue that looks more orange than red. If you happen to love ginger hair, it’ll be like getting two hair colors for the price of one.